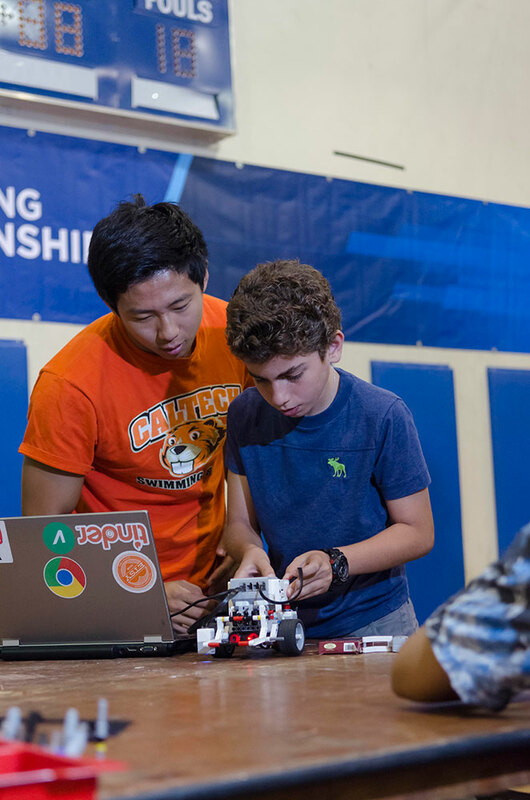 Caltech's InnoWorks team hosted 57 middle school students from across Southern California for a week of hands-on science and engineering projects in Caltech's Brown Gym. 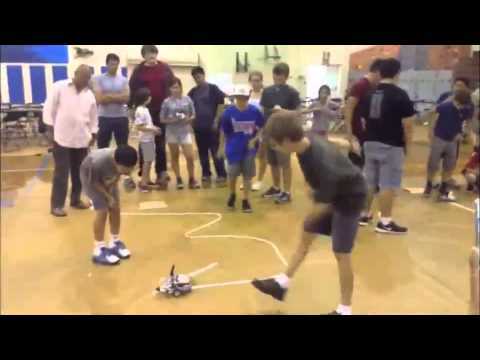 Their parents participated on the afternoon of Friday, June 19, as they watched robots built by their children compete on a slalom-like course. The InnoWorks program was largely planned and run by Caltech undergraduates, according to Charles Wang, a junior majoring in computation and neural systems. A group of Caltech students spends the entire academic year on the logistics, recruiting other students to join in when the time comes. In fact, that's how Charles got involved—his sister Winnie Wang (BS '15) participated last year. InnoWorks has 14 chapters at colleges across the country, and its activities are aimed at female and minority students who have traditionally been underrepresented in scientific and technical careers. Says Wang, "InnoWorks gives us a book of ideas, but we also have to design our own projects, and then we have to test everything to be sure that they actually work and are feasible in the time we've got." Transferring the program from the laptop to the robot. The week's curriculum consisted of 13 hands-on projects, including learning about density by placing eggs in fresh and saltwater (they sank in fresh water but floated in the saltwater); building and racing a Pinewood Derby-sized solar-powered car; and modeling a pollutant's dispersion into an aquifer by filling a plastic cup with water, gravel, and sand before "spilling" a dribble of food coloring on the surface. 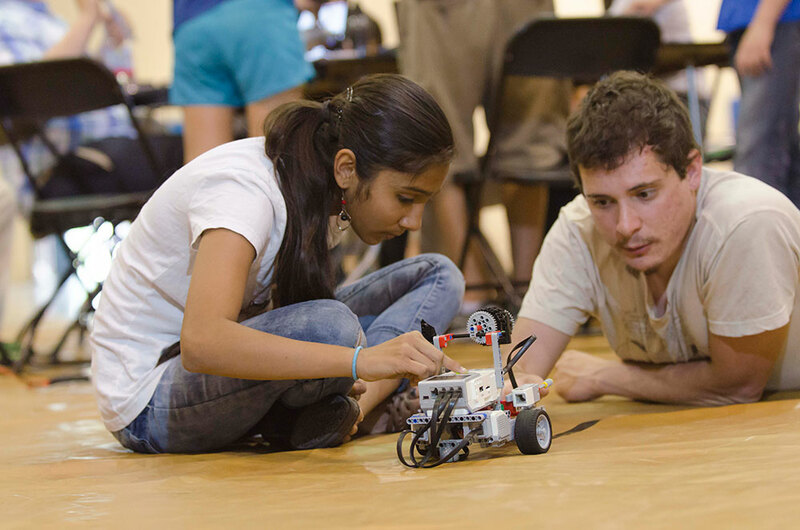 The most popular activity by far, though, was the Lego-based robot race in which the camp's participants were asked to build an "intelligent" autonomous vehicle—in some ways, a mini-Mars rover—from Lego bricks. The connections from the controller to the drive motors and sensors are prominent in this rear view of one robot. For the Lego project, the middle schoolers were divided into groups and assigned to tables of some half-dozen students each. Each table had a classroom version of the "Lego Mindstorms" robotics kit, which consists of a dishpan-sized tub containing a standardized assortment of Lego bricks, wheels, motors, and gears as well as a set of sensor bricks—a photocell, an ultrasound "radar," a pair of touch sensors, and a gyroscope—and a programmable microprocessor built into an oversized Lego brick about the size of a double deck of playing cards. The controller has a USB port for downloading programs from a laptop and phone jacks to connect with the sensors and motors. The programming software contains interlocking icons, not unlike jigsaw puzzle pieces, representing the sensor inputs, motor controllers, decision points, and so on. Selecting the appropriate icons and snapping them together "writes" the program by drawing a map of the robot's desired actions. This robot has its "eye" as close to the ground as the parts would allow. The goal was to build self-driving vehicles that could follow routes marked by lines of tape using the photocell sensor to "read" the contrast between the tape's edge and the tarp covering the basketball court's hardwood floor. The competition featured several courses of increasing difficulty, with the toughest course ending in a V-shaped turn intended to throw the machines off-track. 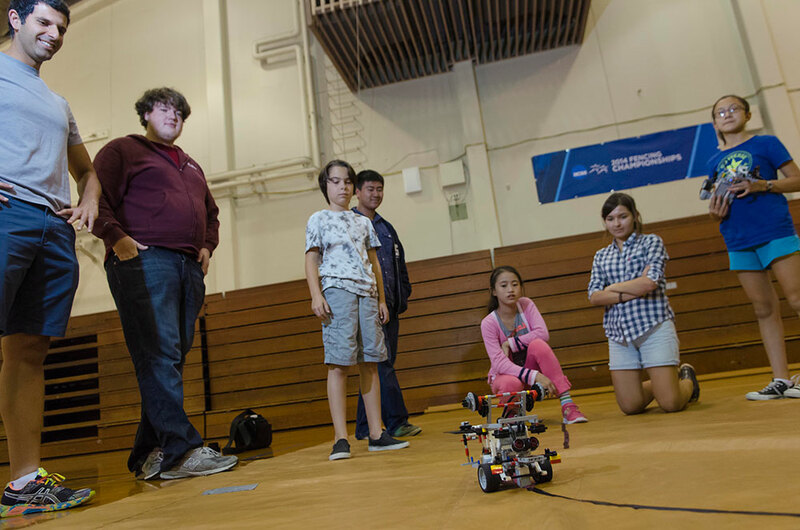 Any robot failing to double back in time would run off the V's point, so the students had to design against a real-world engineering problem: How do you find your way back on course after making a wrong turn? InnoWorks advisor Spiros Michalakis, at left, looks on as a robot takes a test drive. The answer, says Spiros Michalakis, the InnoWorks team's staff adviser and a member of Caltech's Institute for Quantum Information and Matter, is "a double differential analysis, which means you have to look both left and right to find the edges. This is really hard when your kit only has one sensor." The photocell could be mounted on a sideways-scanning swivel, but most groups opted for a fixed downward-looking arrangement. But now the whole vehicle had to pivot in order to keep the edge in sight, so a robot attempting to follow a straight line would drive in an S-shaped trajectory across it. Says Michalakis, "This takes pretty high-level object-oriented programming. But they sat down and figured it out." 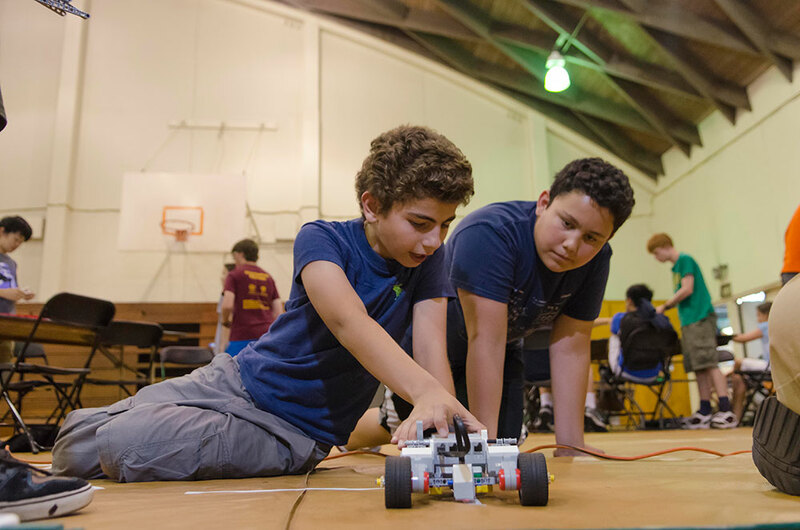 According to Jacob (Coby) Abrahams, the junior majoring in geology who ran the robotics event, "This year we gave the kids way more time to solve the problem. Last year only two of the 10 or so teams were able to compete, and neither one finished the track. This year every team was competitive and most were pretty successful." Aishwarya Mahesh, who attends Meadowbrook Middle School in Poway, has come to Caltech's InnoWorks the last four summers. Last year her school finished second in the Southern California FIRST Lego League, and, she says proudly, "We were invited to the international championship!" It was held in Arkansas, but she's quick to point out that a team from Japan won. Is a Caltech degree in her future? "Maybe," she says. "Or Stanford. But I don't know if it will be in robotics." But even if she opts for none of the above, she's definitely heading in the right direction. Science and science fiction shared center stage, both sartorially and cybernetically. These t-shirts feature (from left) a storm trooper from Star Wars, a space camp, and the various Doctors Who. The cylinder on the robot's deck is a Dalek, an evil robot seen in the Dr. Who television series.